Dr Olivieri and his wife, Dr. Rita Olivieri created patient safety videos for use in both the VA Hospitals and Boston Children’s Hospital. The videos were provided both on DVD and as an interactive website. The purpose of the DVD and website is to provide a standardized patient safety curriculum for new employees, students, residents and clinical instructors rotating through the hospital setting. The program is designed as a tool for the Patient Safety Manager and those teaching patient safety concepts to use as an adjunct to their Patient Safety training program. Patient safety concepts can be taught by a variety of staff and key concepts can be customized to both clinical and non-clinical audiences. 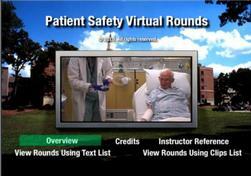 This program provides vignettes of real patient care settings in which subtle safety errors are staged. Participants watch each video vignette and detect patient safety errors and vulnerabilities while developing critical decision-making skills needed to advance a culture of patient safety. Each video has one or more types of patient safety risks. This allows for customized training sessions which can be presented by scenario, or by patient safety risks. For each vignette, there are two videos. The first video is the unedited version of a scenario in the hospital setting. The second video is the same vignette with the safety risks identified. Trainees would be given the opportunity to view the unedited version as often as they wish, and they try to identify all of the safety risks that they observe. This would be followed by the second video vignette that has the safety risks identified. The Instructor may want to have a discussion about the safety violations observed prior to showing the second safety risk vignette. The Instructor could also show the two videos and then have discussion. It does not matter in what order the videos are shown, however a critical learning element in this training is for trainees to have the ability to ask and respond to questions. This allows the instructor to discuss local policies and procedures which may be slightly different than what is shown in the videos. This training program is designed to be used either as a self-directed learning activity or in a didactic orientation setting. The program can be taught by a variety of staff in various settings ranging from the college classroom to the hospital orientation conference room. It does not require Patient Safety staff to present the information first hand, however they should be included to help identify the learning needs of the population where the information is being presented. Evidence of learning can be evaluated by conducting a pre and post test (verbally or written), or by using a written evaluation of problem solving and decision making approaches related to patient safety. The safety risks identified in these videos are based on the Joint Commission National Patient Safety Goals and Joint Commission Standards. The hand hygiene guidelines are based on the World Health Organization (WHO) Hand Hygiene Guidelines and 5 Moments of Hand Hygiene Campaign http://www.who.int/gpsc/tools/en/ . A quick reference guide was developed locally as an additional orientation cognitive aid by the VA Boston Health Care System Patient Safety Program and the William F. Connell School of Nursing at Boston College. On behalf of the VA Boston Healthcare System Patient Safety Program & Boston College William F. Connell School of Nursing, we would like to thank the National Center for Patient Safety for the opportunity and funding for this Patient Safety Initiative Project and for the VA Boston Healthcare System & Boston College volunteers who made contributions to this project.